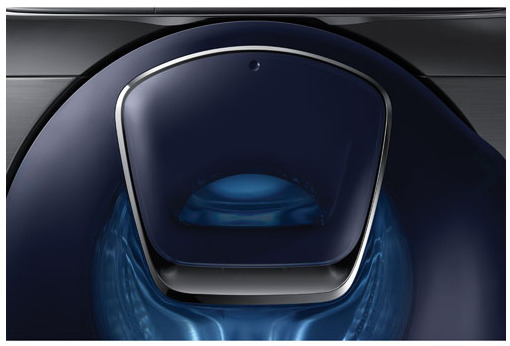 Laundry smarter, not harder. The Samsung WF45K6500 front load washer features a 4.5 cu. 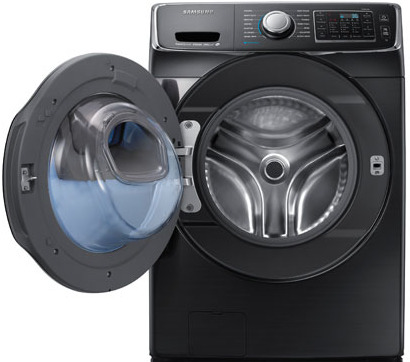 ft. capacity, so it can wash more clothes at once. The AddWash feature lets you add a missed item to your wash, saving you time. It has Super Speed that reduces the time of each cycle and Vibration Reduction technology for quiet operation. 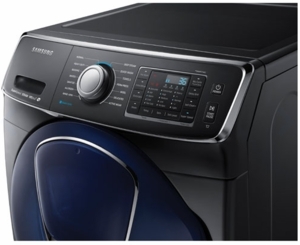 Dispense with laundry duty in no time thanks to the washer's generous 4.5 cu. ft. capacity, which can handle family-sized loads and bulky items, such as linens and towels, with ease. Tight on space The front load design lets you match the washer with a stacking dryer, freeing up valuable floor area if you stash the pair in an out-of-the-way closet or storage space. Stains aren't created equal, so take advantage of 14 distinct wash cycles to effectively tackle everything from summertime grass stains to holiday dinner gravy spills. Cycle options include Normal, Heavy Duty, Perm Press, Sanitize, Allergen, Towels, and more. Plus, powerful steam wash eliminates the toughest stains, and reduces and removes wrinkles, odors, and bacteria. Pressed for time Select the Super Speed option -- which dramatically reduces the time of each cycle -- and finish that extra load faster than ever. That means you'll spend less time doing laundry and more time doing the things you love. Finding the time to do laundry can be hard enough. Finding the time to clean your washer's drum is even harder. That's why this washer is outfitted with Self Clean technology, which removes odour-causing bacteria from the drum and gasket without using harsh chemical detergents. 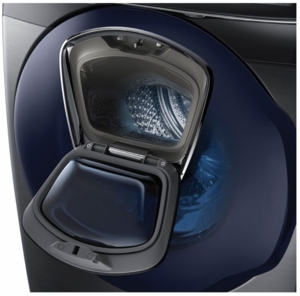 Tired of having delicate fabrics and linens snagged in your washer, only to come out with loose threads The diamond-shaped surface on the drum of this washer is gentle on clothes wash after wash. Reducing washing-machine wear and tear on your clothes means they'll last longer. Nothing ruins a relaxing night at home faster than a noisy, vibrating washing machine thumping away loudly in the background. This unit, however, features VRT (Vibration Reduction Technology) to ensure a quieter, smoother operation time after time. Don't like unpleasant surprises The Smart Care technology built in to this washer actively monitors, detects, and diagnoses technical problems at an early stage, then provides easy-to-follow troubleshooting tips on the LCD screen. 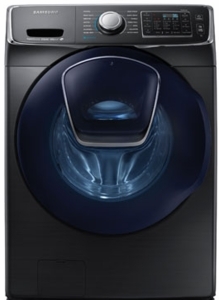 ENERGY STAR qualification means this washer requires less water per cycle and reduces the amount of energy required for each wash. And with 5 water level options and 5 temperature settings you can select the ideal conditions for any wash, saving even more water and energy.